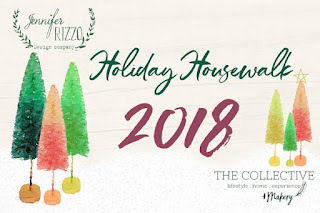 Hello and welcome to this year's Holiday Housewalk hosted once again by the talented Jennifer Rizzo. 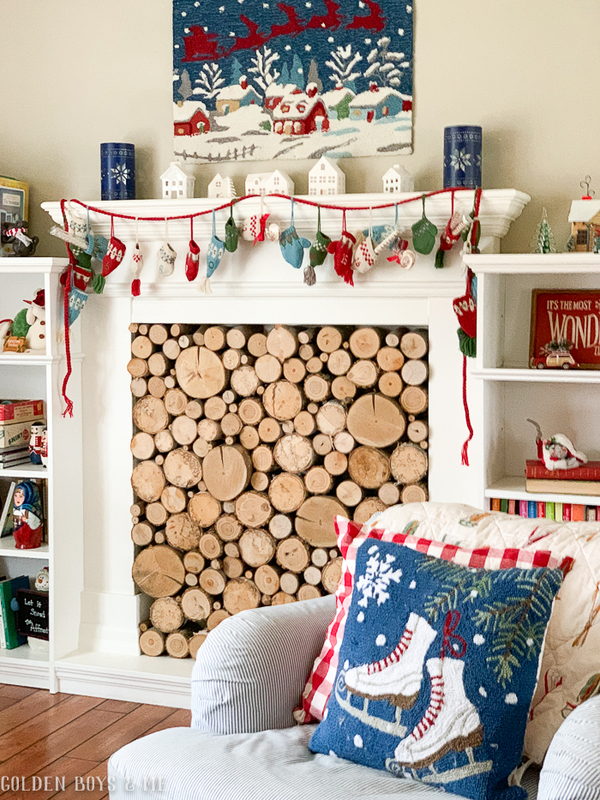 For me, Christmas is all about traditions and I love that this housewalk has become a part of my holiday blogging tradition. 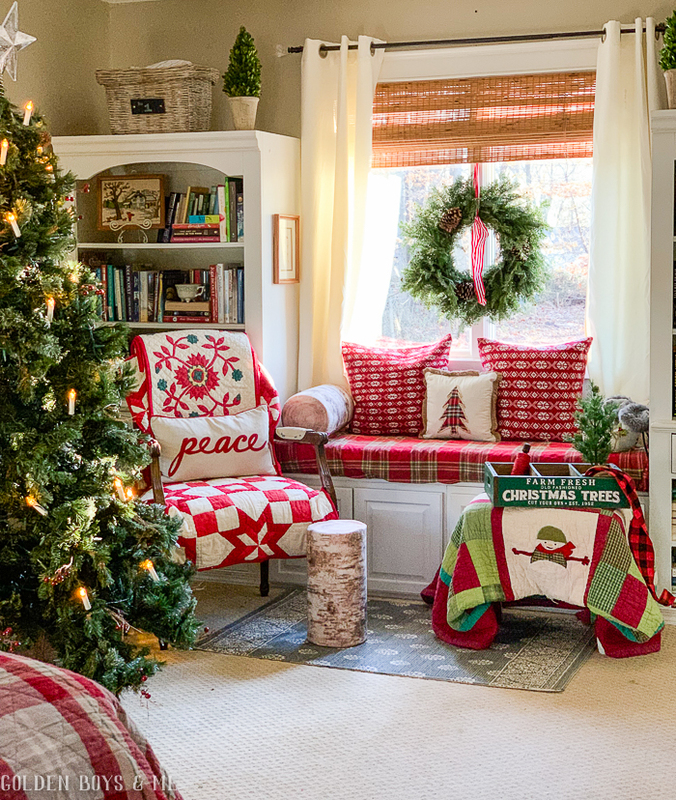 For as long as I have been reading blogs, Jennifer Rizzo has been hosting this amazing line-up of Christmas homes. I am honored to be included once again. You can start this year's tour by clicking on the button below. 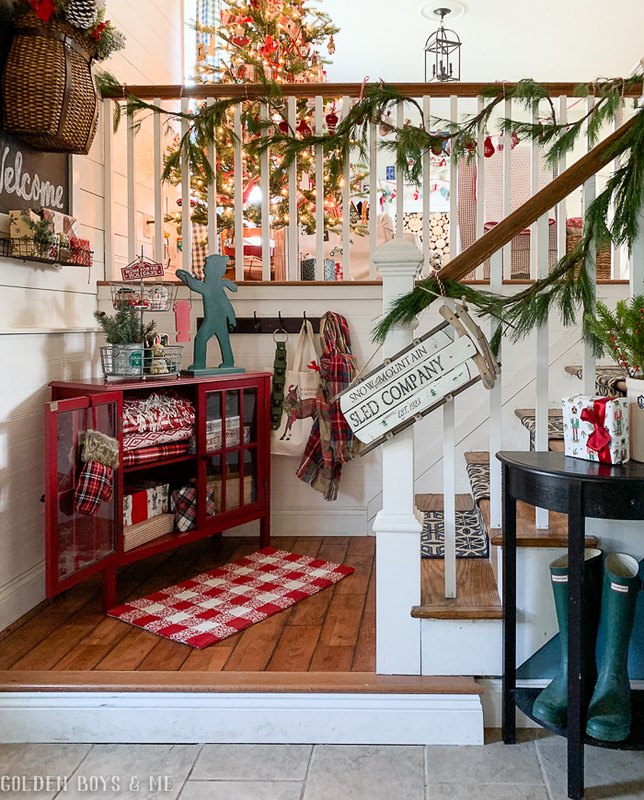 The tour continues all week so be sure you visit ALL of the homes for tons of holiday inspiration. 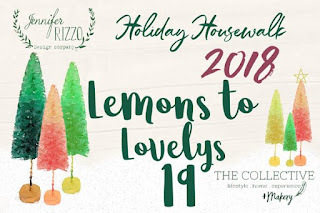 If you are following along on the tour, you just landed here from Marci's beautiful holiday home at Lemons to Lovelys. If this is your first time here, my name is Courtney. My husband and I, along with our 3 teenage sons, have renovated our split level home in a NJ suburb one room at a time. 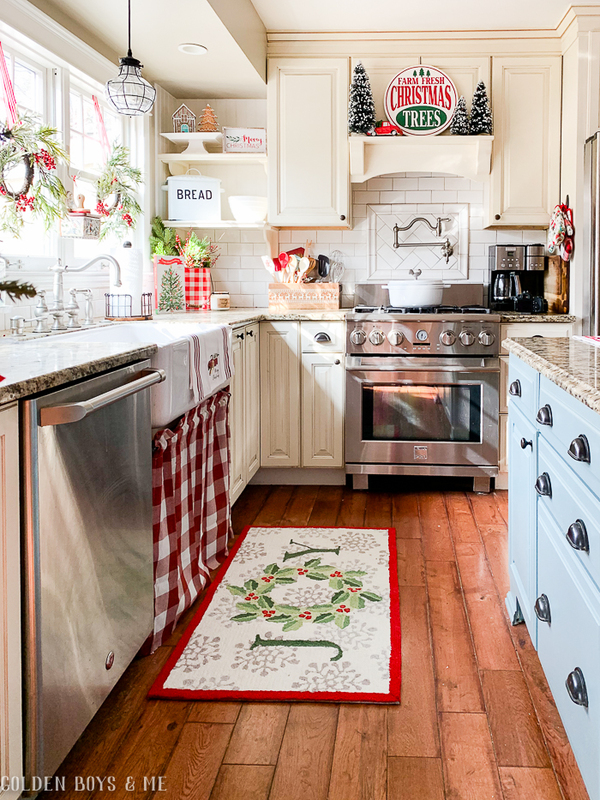 The heart of the home is always the kitchen so let's get started on the tour in there. 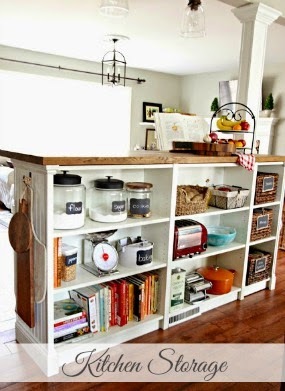 I am super excited about our newly painted kitchen island and how much it has updated our space. 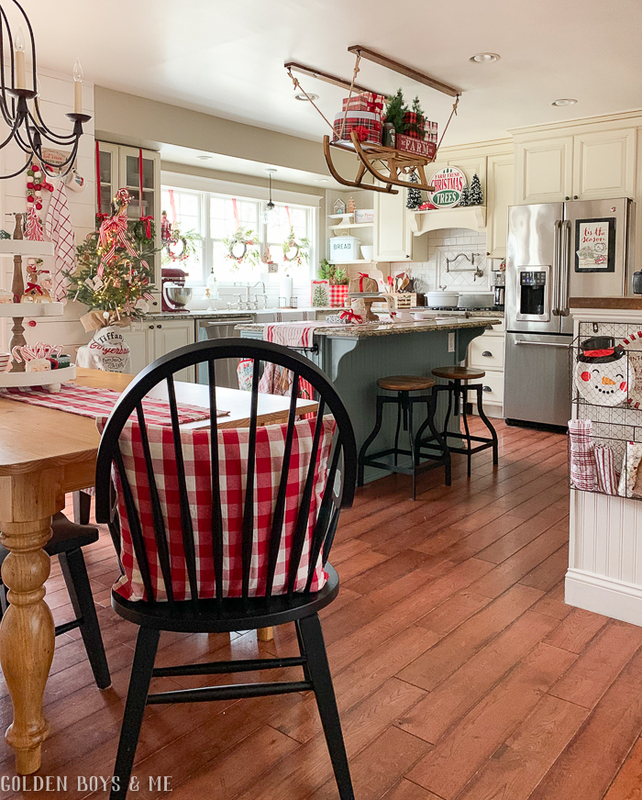 The new color lends a cottage-y feel to our kitchen that works lovely with our Christmas decor. We decided to hang the vintage sled over our island for an encore year. We did this a few years back and our family and friends have still been talking about it. This year, I went with more of a "tree farm" theme for the sled decor. 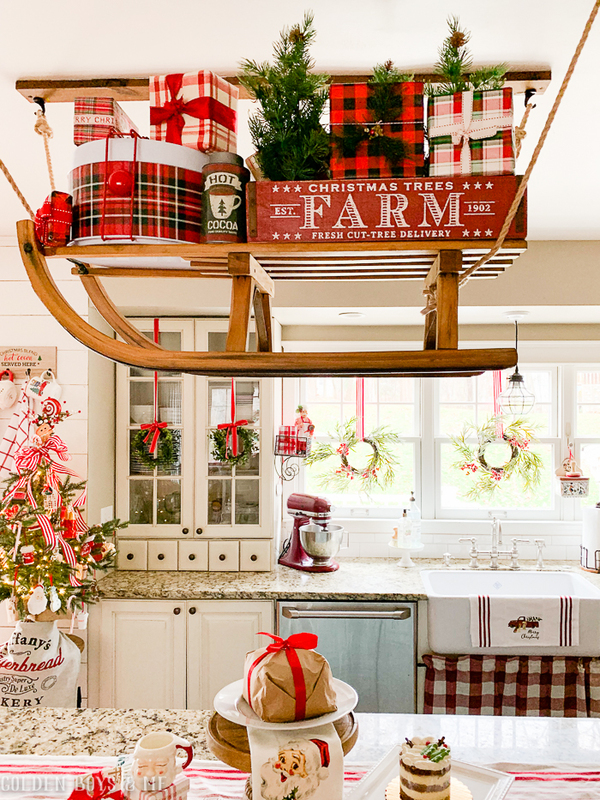 We usually have a pot rack hanging over this island so we simply used the hooks already on the ceiling to suspend the sled. 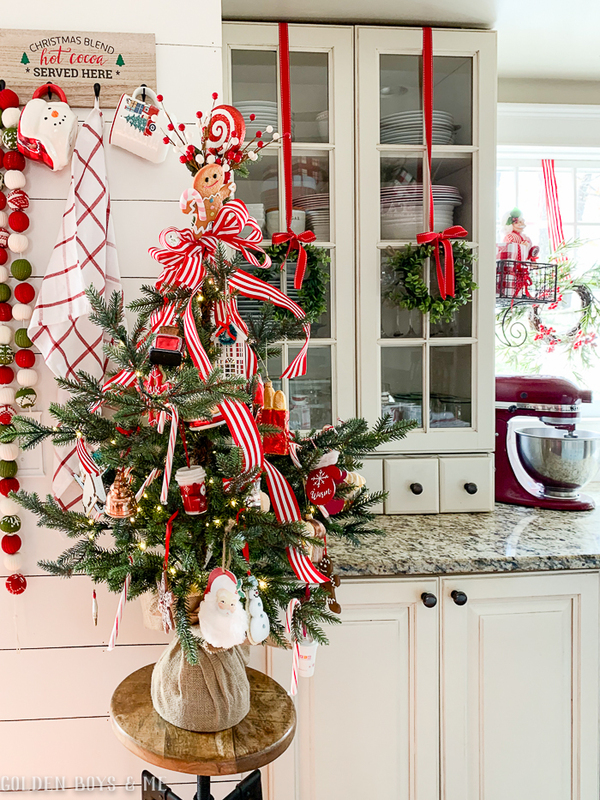 I always enjoy decorating a smaller kitchen tree with the food themed ornaments that I collect each year. 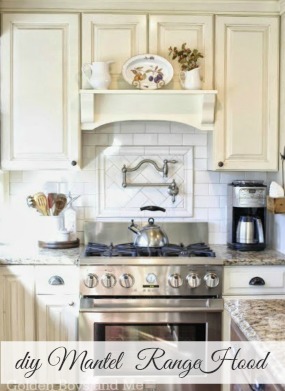 The three windows over our farmhouse sink are always a focal point in our home. 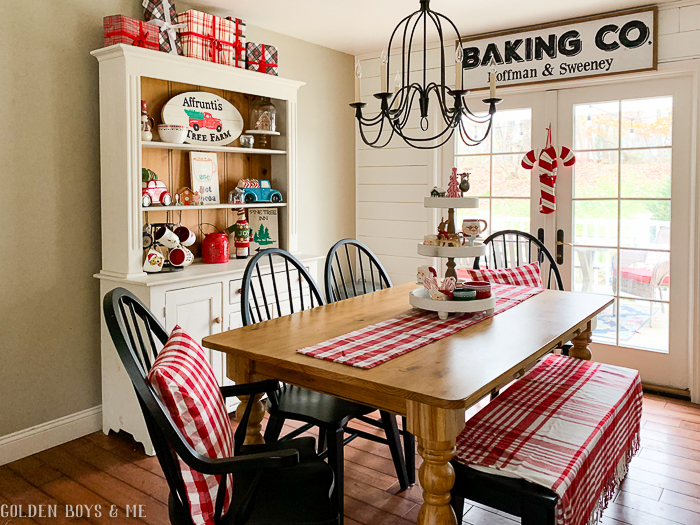 I added 3 wreaths, purchased at HomeGoods recently, hung from the double hung windows with a red and white striped ribbon. We removed all of the walls on this level to create a family living space that works wonderfully for our family. I carried the festive and classic holiday decor over in our dining area as well. Nothing fussy, just cheery. Over in our upstairs living room, I kept things bright and nostalgic, which is everything I think Christmas should be. The imperfect tree displays all of our collected family ornaments. I used our old LL Bean sled that we once used to pull all three of our little boys around in for years as the base. I simply set the tree base atop the seat of the sled and covered it with a plaid scarf. 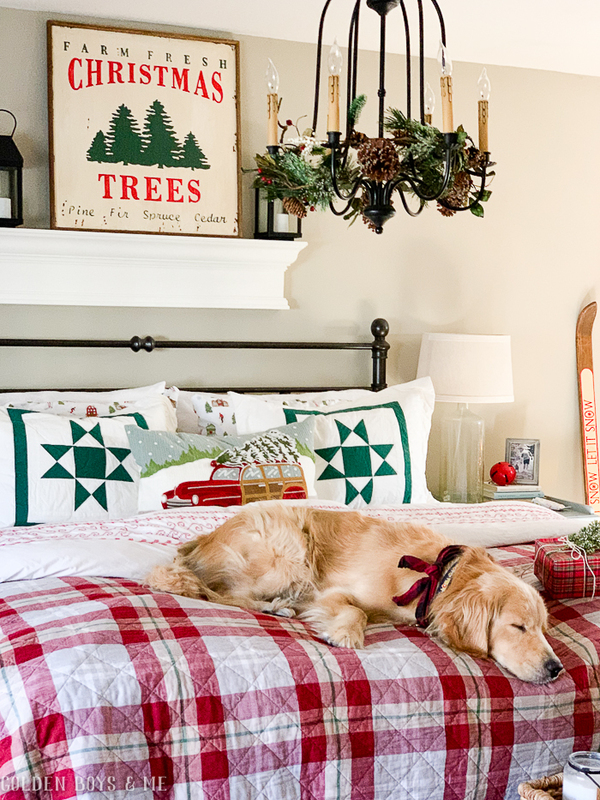 A sleeping golden just adds to the lived in feel of this room. To tie things together with the newly painted island, I knew I wanted to keep a lot of blue in this room this Christmas. 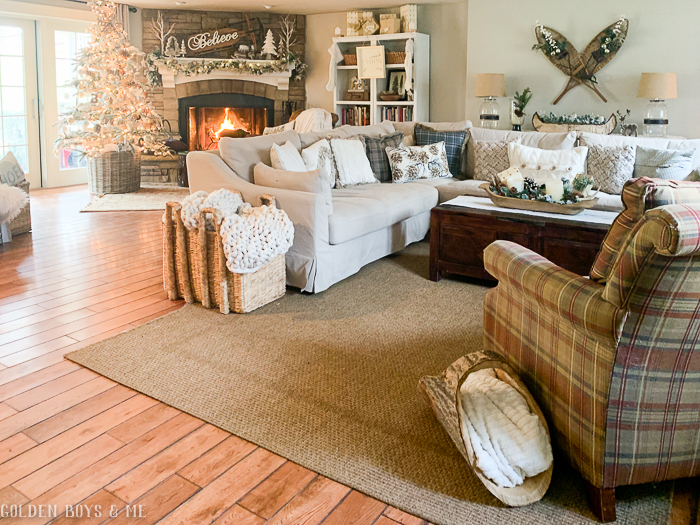 When I spotted this area rug, I thought it would work perfectly over our mantel. It adds both texture and color and is a very affordable option for "art" over the mantel. It picks up on the colors of our hat and mitten Advent calendar as well. 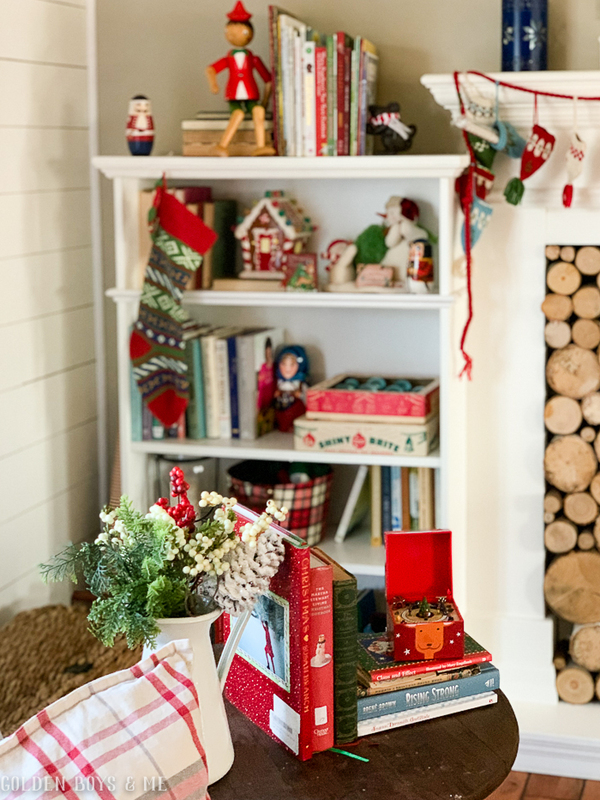 The bookshelves hold memories of Christmases past in the stories we read to our boys and the items we have collected throughout their younger years, like nesting dolls and snow globes. Even though they are older, they still love seeing these items each year, perhaps even more so? The magic of Christmas knows no age and I know they still hear the bell at Christmastime. 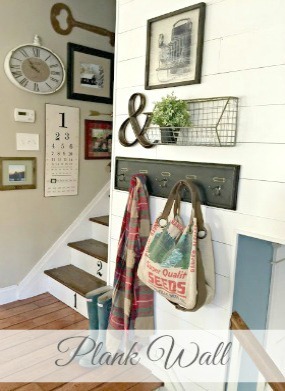 Next, let's head downstairs through our front entryway to our lower level family room. 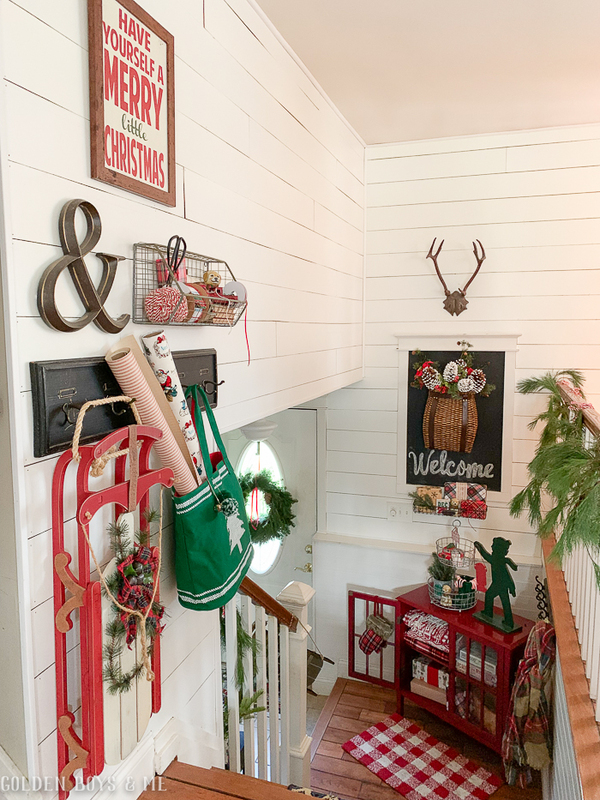 Our small mudroom is always fun to decorate and I continued the tree farm theme in here as well. 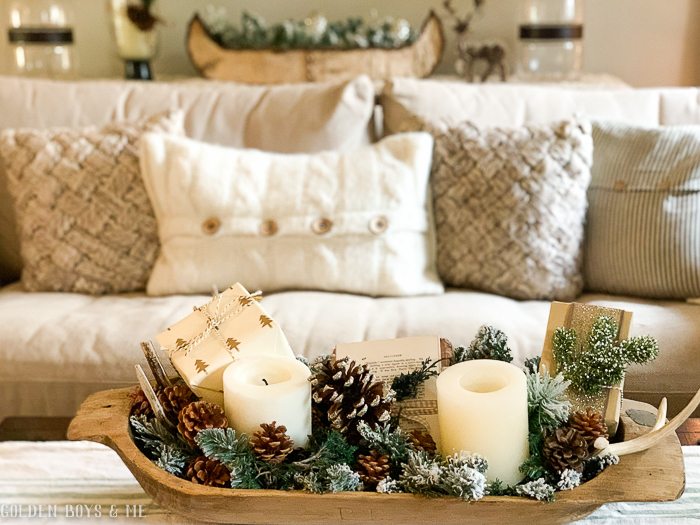 I kept things more neutral in our family room and I like that this area feels a bit different than the vibrant colors in the rest of the house. 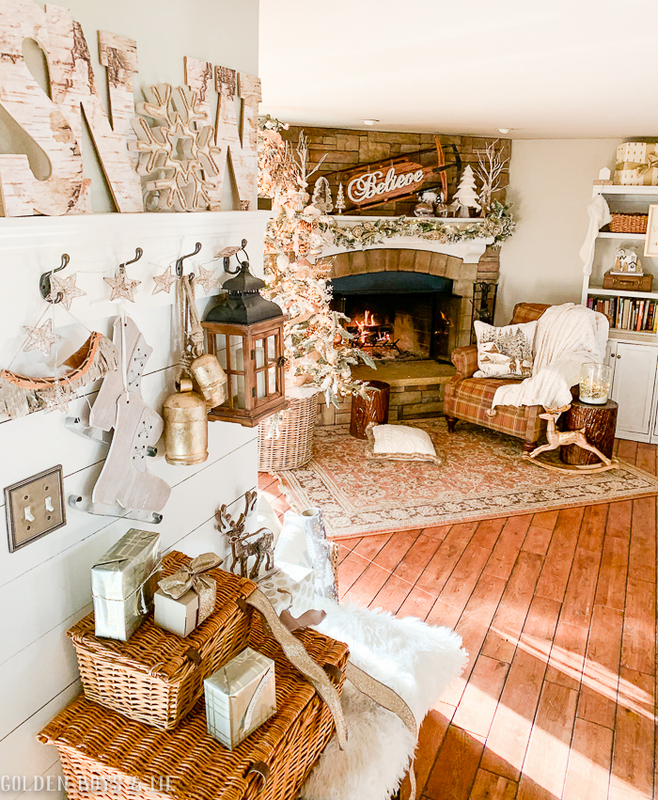 I especially enjoy how the neutrals and sparkle work with the rustic stone fireplace. 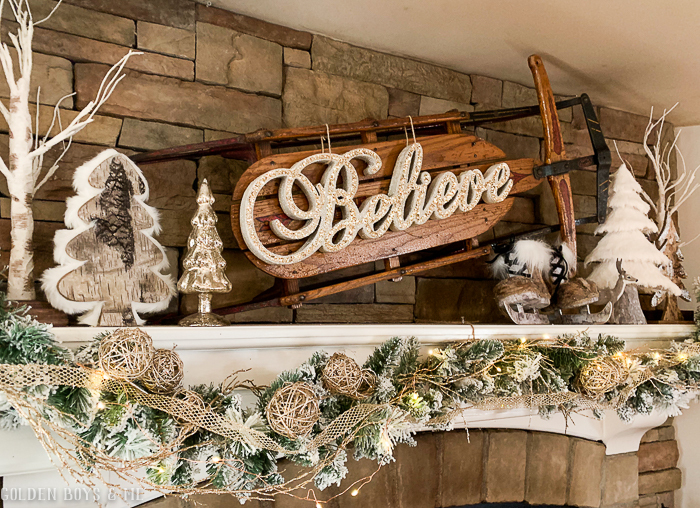 I used a vintage sled atop the mantel and added some glam with the glittery Believe sign. Then I just added an assortment of trees and birch bark items. Finally, let's head all the way to the top level of our home. 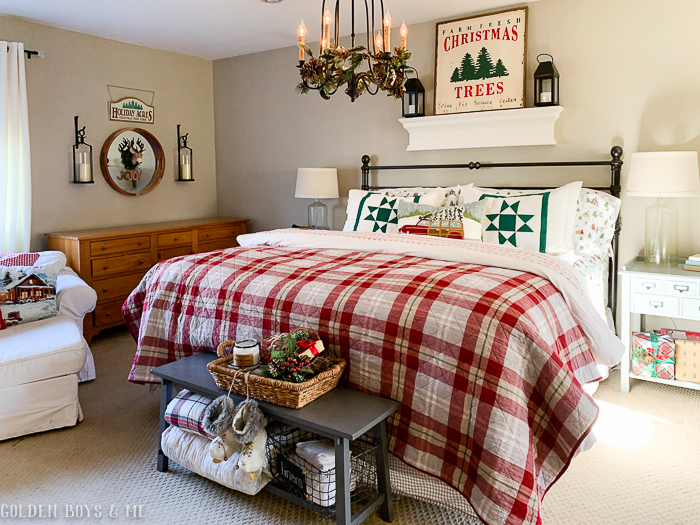 I also enjoy adding some Christmas touches to our master bedroom. I kept the tree really simple up here with just the addition of some candle lights. 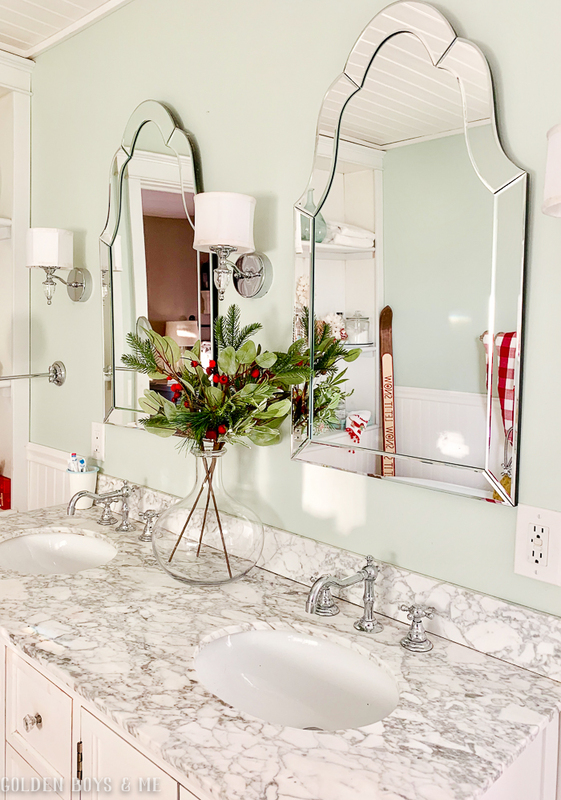 I even add a few holiday decorations along with some Christmas scented soap and bubble bath to our master bathroom. From our family to yours, we wish you Happy Holidays and a happy & healthy New Year! Next stop on the tour is lovely home at Number Fifty-Three. 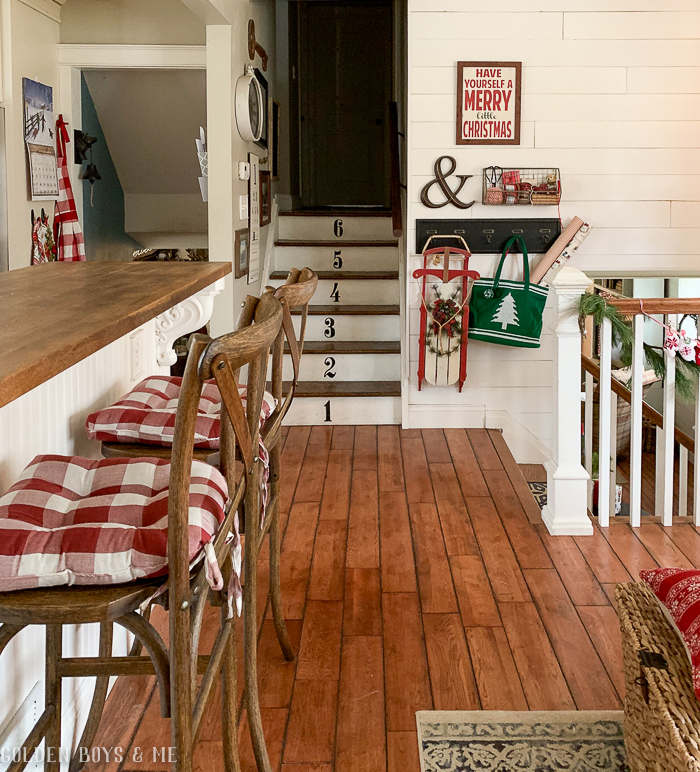 I love checking out your home...it's always looking so happy and cozy! If I wasn’t in the mood before I certainly am now! I love it all! 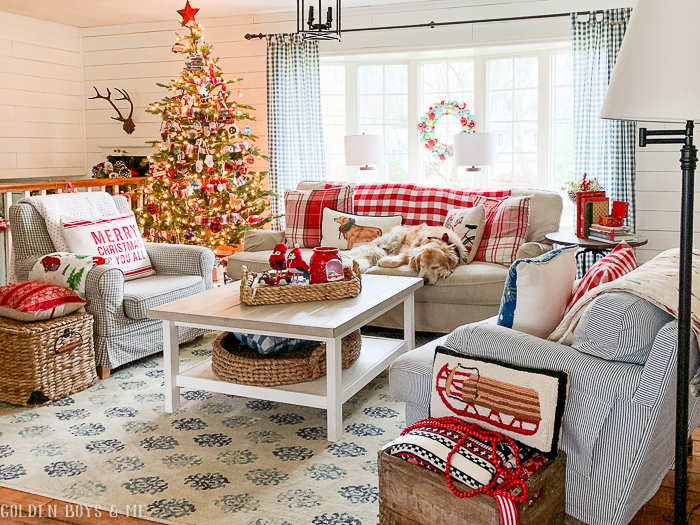 Love the holiday colors and then the more neutral theme in the family room downstairs! Just beautiful! I hope you all have the loveliest of holidays! Thanks so much, Chris. I'm so glad you enjoyed it. Merry Christmas!! I always look forward to your Christmas tour! LOVE it all. The sled above the island is so adorable and the new island color looks amazing with all the decor. 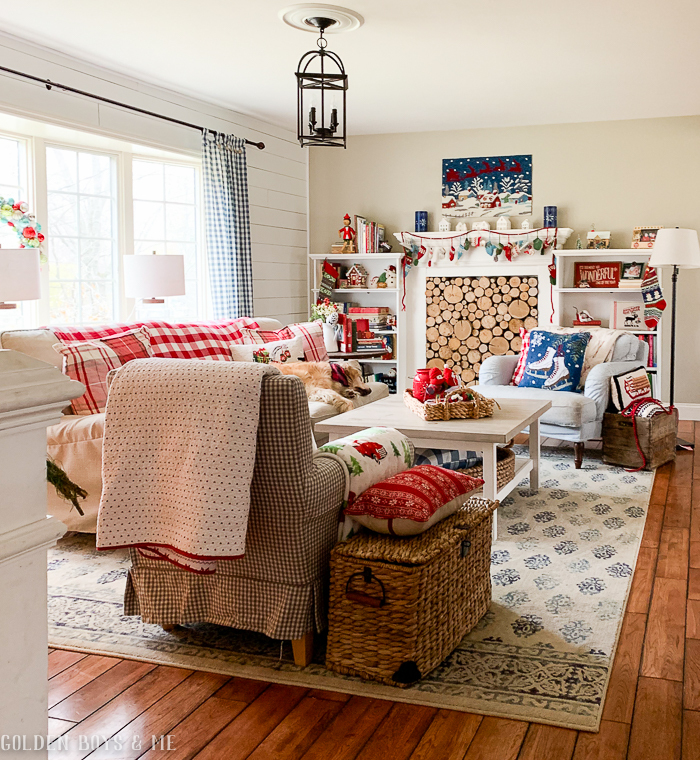 I also love that you decorate with a lot of red. 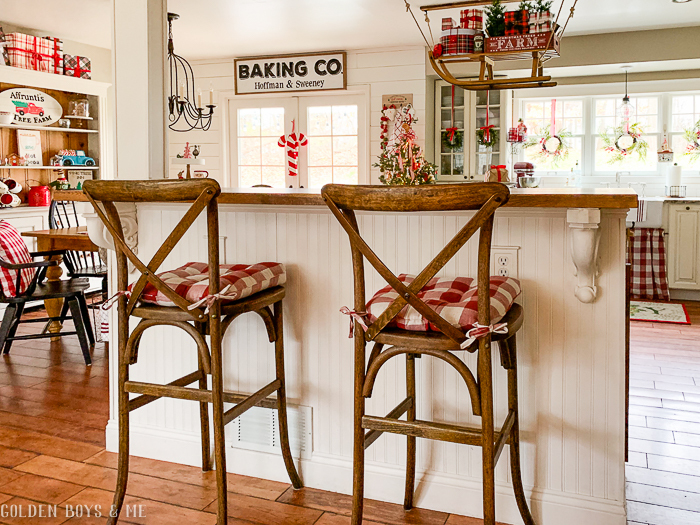 As much as I love when I see neutral decor, the red just speaks to me more at Christmas. I use it every year too. Gorgeous home, Courtney! Now you can sit back and enjoy it all in the next few weeks! 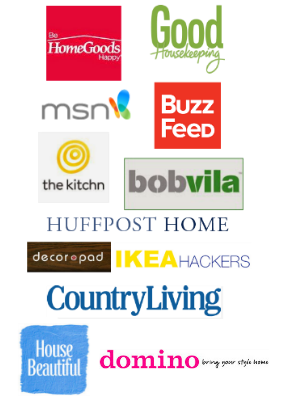 Thanks so much for stopping by and pinning, Jennifer. Merry Christmas! Wow! 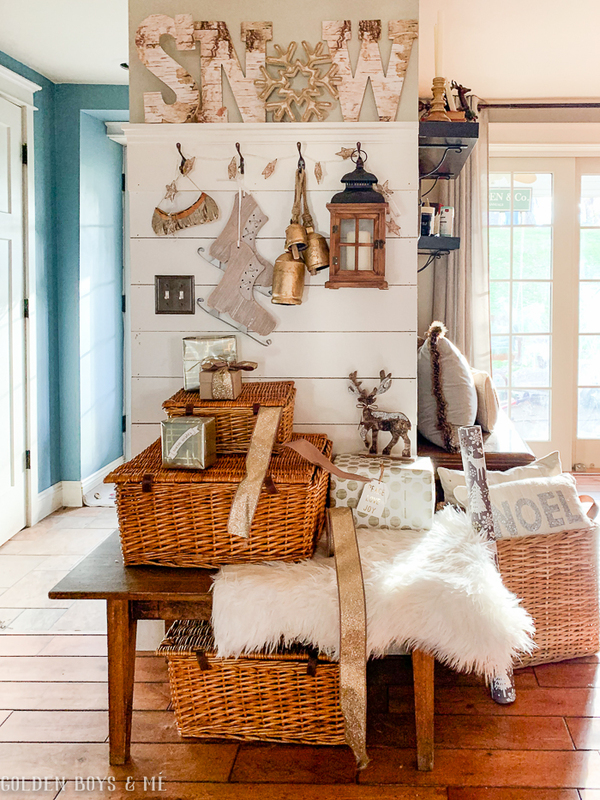 I love visiting your home anytime you do a tour... or just show a room! Your home is Stunning! Love it all! 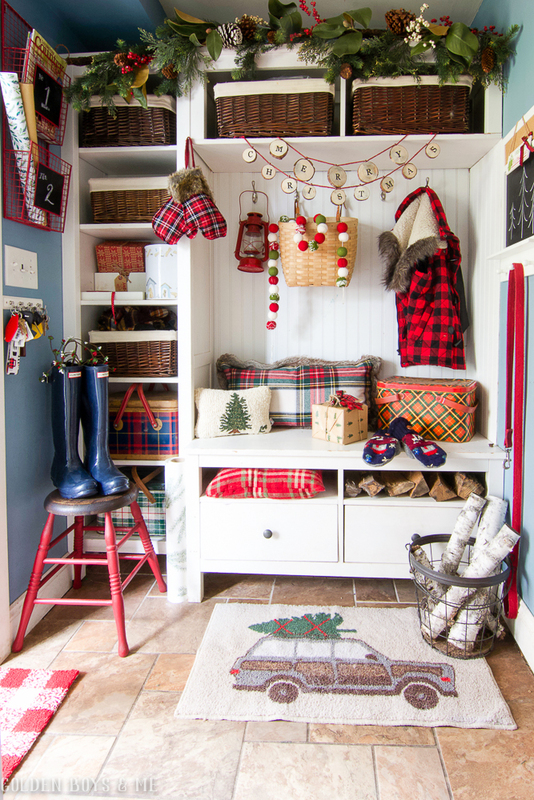 Was so excited to "tour" your home again this year ... all decked out for Christmas !! Gorgeous... Love.. Love all the red !!! Merry Christmas !!! Oh my gosh, your house is just gorgeous! I used to be live in a bi-level and when I see what you’ve done in your home I wish I still had mine! Thank you, Courtney! Your holiday home brings back so many memories of our home with the three boys. Although Lavender Hill was probably never as stunningly detailed as your home, I always strived for the feeling of love that yours perfectly exudes! 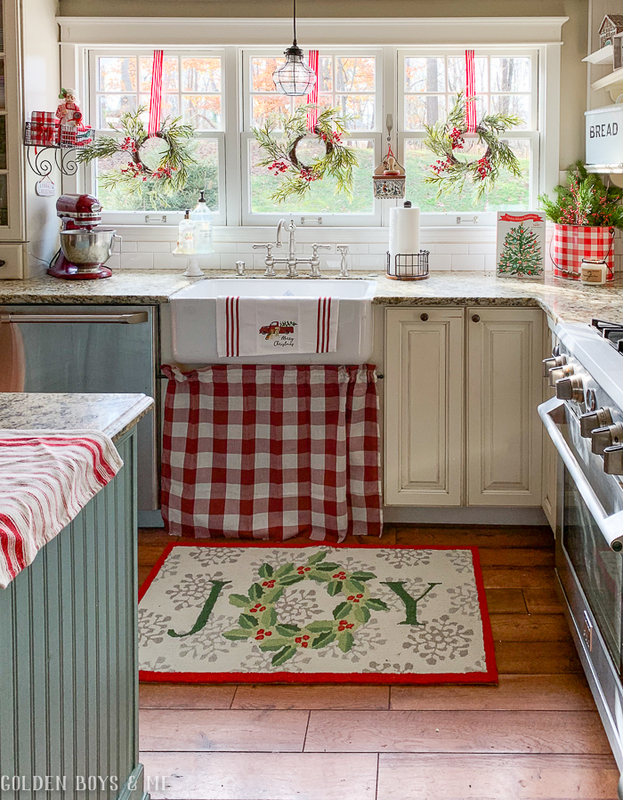 My favorite day of the year, your Christmas Home tour! The house looks beautiful as always. And yes a sleeping golden does add just the right touch. Happy holidays! 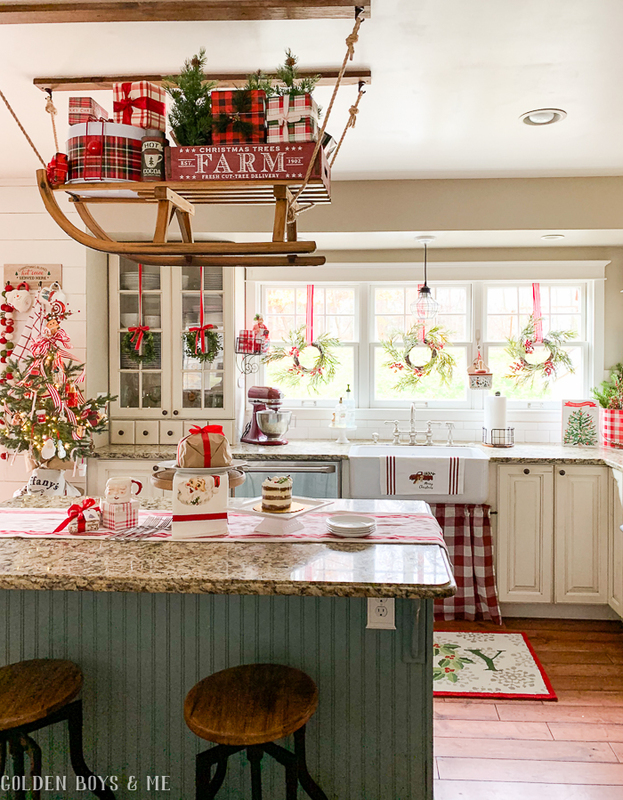 What fantastic decorations:-))) Love your kitchen and the sleigh above the island is a great idea! Oh Courtney the house looks beautiful and so festive. Just gorgeous decor. I bet it is so pretty at night too. Have a great week and fun finishing up your decorating. 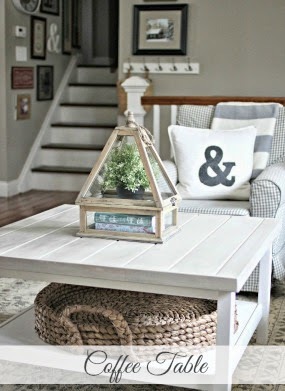 Courtney your house is always a favorite! 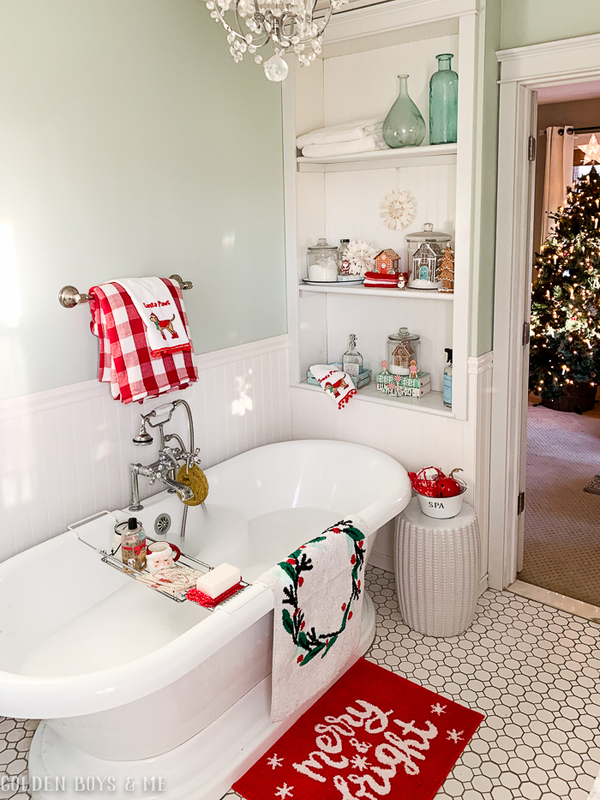 Right down to the bathroom - Christmas decorating goals! 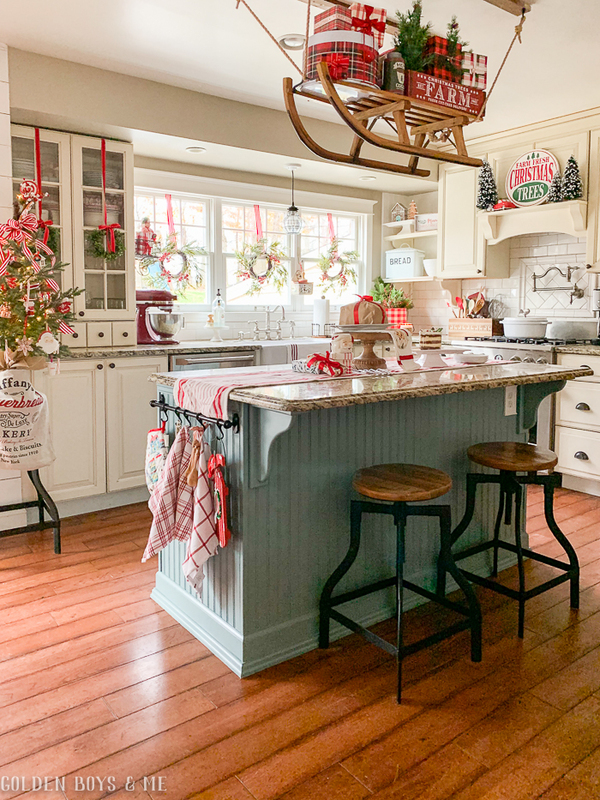 Your kitchen sled is always something to look forward to. 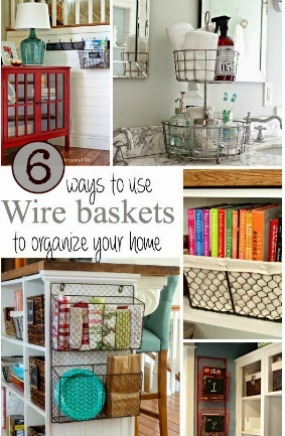 Hi Courtney, Love everything in your home! Do you mind me asking, is that a runner on the buffet type piece of furniture with the canoe and glass lamps on each end. It looks like sweater type material but also looks like some kind of runner!! 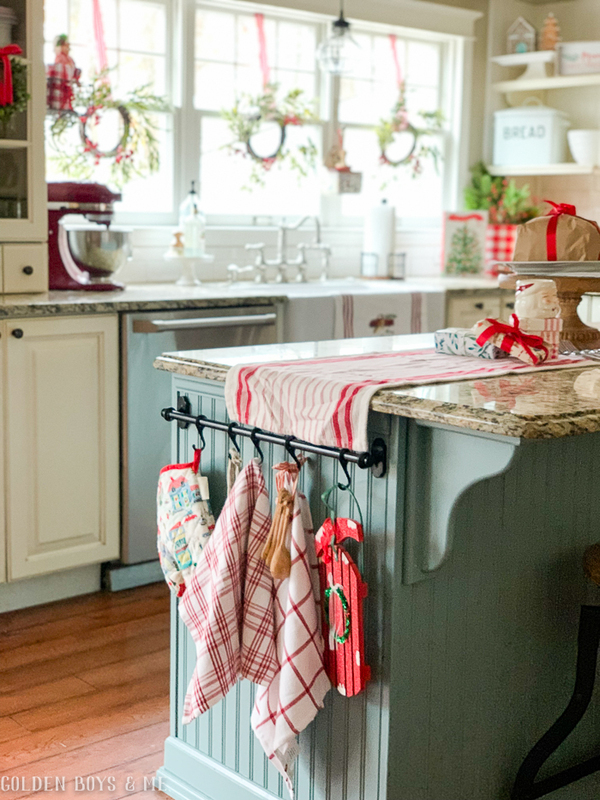 I love everything about your beautiful home, Courtney...amd all dressed up for Christmas, too! So wonderful!! 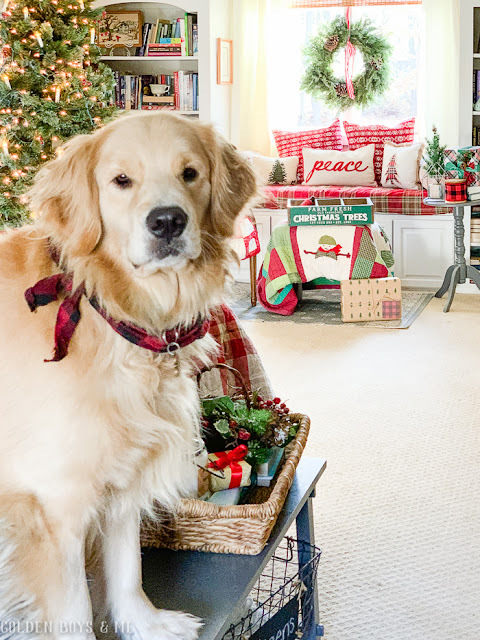 You have the most festive home...I love it! Everything looks wonderful! Your home is always a favorite of mine at Christmas time. Amazing as always. I finally found the Golden pillow at Home Goods this year. Perfect timing as we brought our Tucker home recently. Lots of puppy kisses in our house these days. What a fun and happy tour. 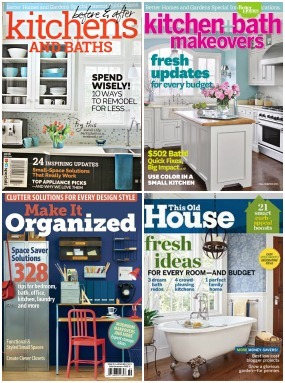 I love your kitchen with the pretty blue island. I bet you do a lot of baking in here. I love how open your kitchen and living area feel. The colors you've chosen to decorate are so happy. I also love the neutral living room, but I think my favorite photo is of your sweet dog snoozing in bed. So adorable! I adore your home, it is so festive and just gorgeous! 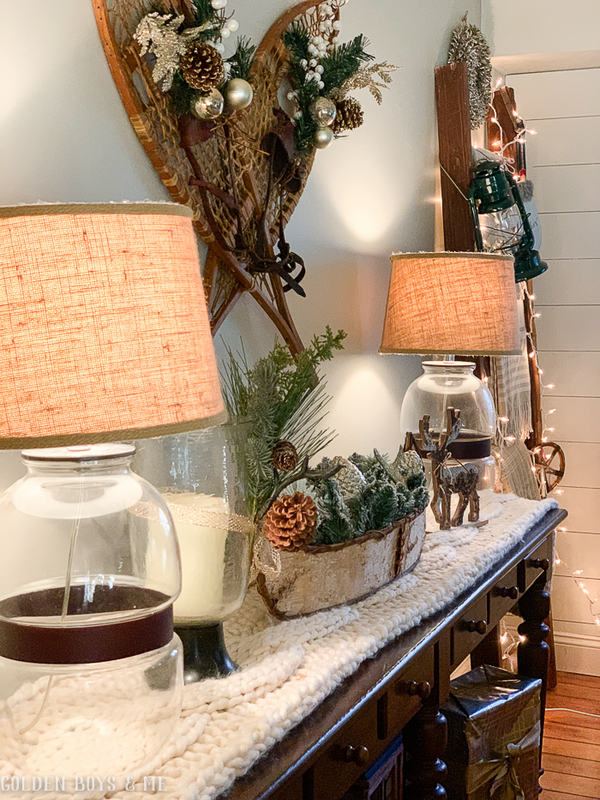 This is my first visit and I can’t stop looking at your beautiful home and your festive decor. I love everything. 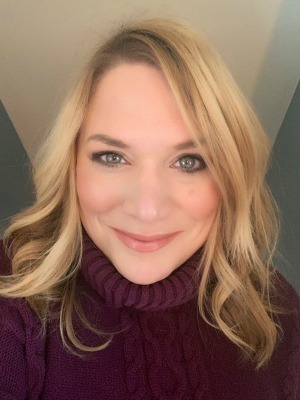 Oh my gosh, you are amazing, Courtney!! I thought my decorations looked nice....until I popped over here and realized I did NOTHING in the way of decorating compared to you, wowzers!! Gorgeous, your house should be in a magazine or on a Hallmark movie!!! Courtney, thank you so much for sharing your home with us at this most blessed time of year. 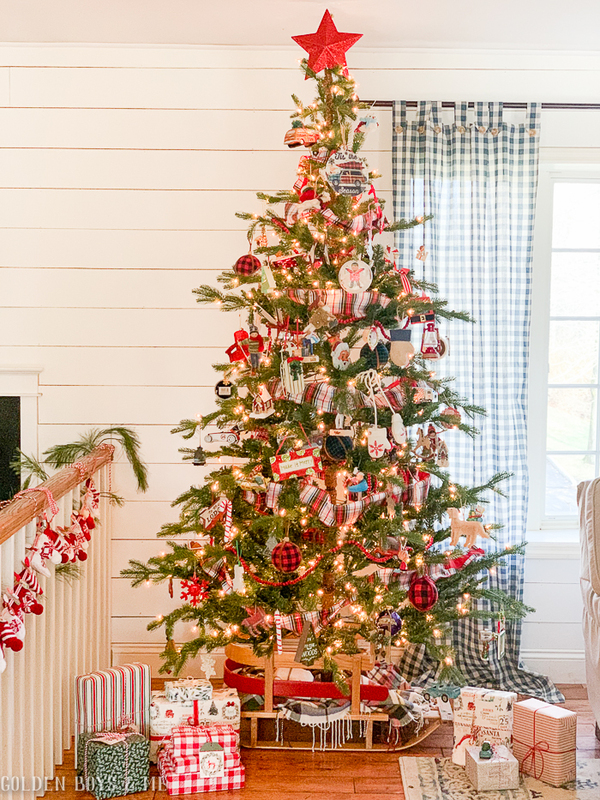 Love your style of using older, precious ornaments and decorations. Merry Christmas!! love,love, love! Can I bother you for a source for your carpet/rug in the living room with the blue and white chairs?? I love it and the rest of your home!! Just so beautiful! It must take forever to get it all done! What a stunning house!! I love it so much!! I see Christmas in every corner! I love every single detail. Thank you for sharing! 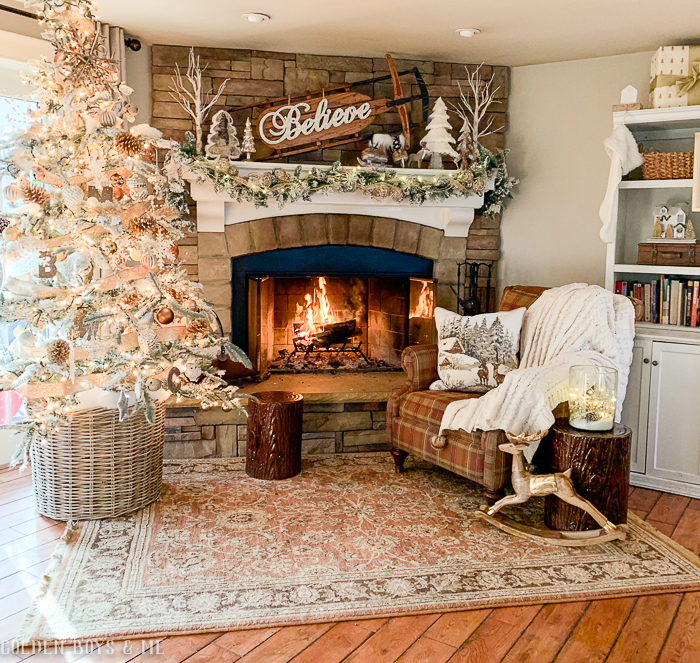 Absolutely beautiful, cozy and homey! I love every inch. Wow, I am really impressed with your Christmas spirit! 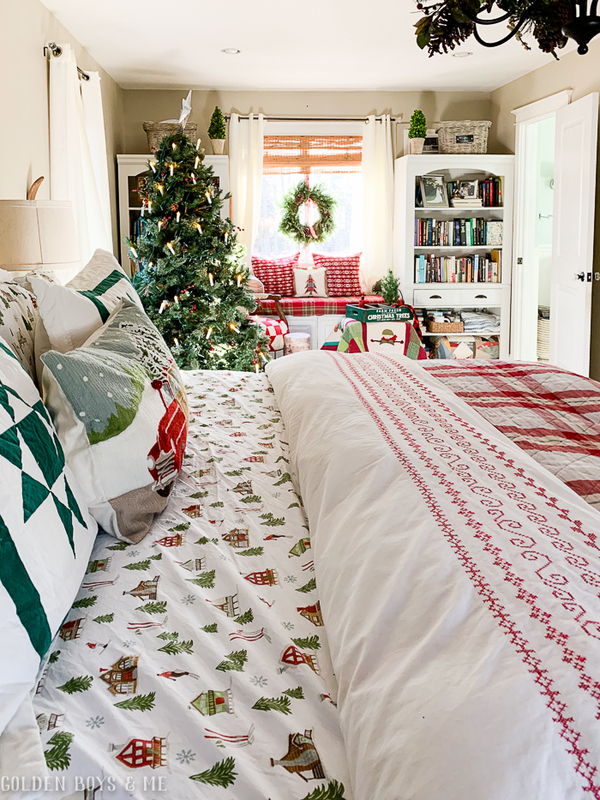 Everything looks fantastic and I'm even more inspired to do some more decorating around my house! I know how long all this must have taken you (it takes me a solid week to do all the decorating and I'm pretty sure you have me beat!). Love it all! Wow!Your house is absolutely amazing! Every decor has its place. Love it! 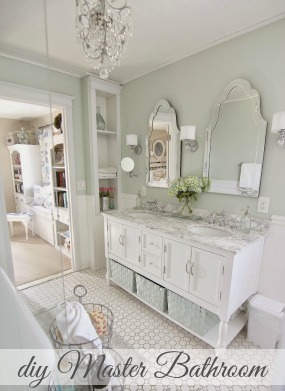 Love every little detail..so warm and inviting!!!!Fantastic!!! Oh my goodness!!! Just beautiful!!! I do red and White, so I'm going to nab a few of your ideas . ok. Probably all of them. I have a sleigh. A little different than yours. Maybe I can get my hubby to put it up. You did an amazing job!! It makes me feel happy all over!! I fell in love with your colorful rooms this year, so I borrowed 2 photos and featured your living room with a few links to this post. Thanks for all the inspiration I soaked in from viewing this post! 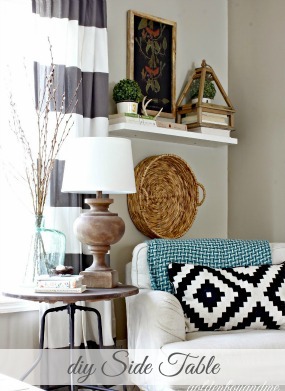 Love your red, but love the neutral room too. So pretty! So glad I found your site. Your style is so warm and cozy! I love it all! I need to get back into blogging. I did it for several years, but lately been concentrating on some FB groups I manage for olden TV shows. Anyway, Merry Christmas! Great job! Some many rooms to play with! You must have a really large home! Do you do all this by yourself and how long does it take you? Thanks!